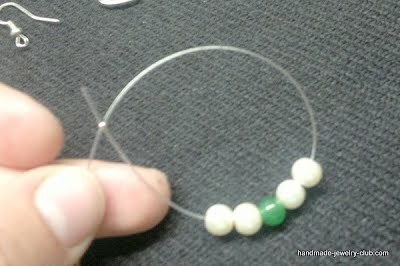 Earring hoops are a fad and so here’s one jewelry making idea for you! 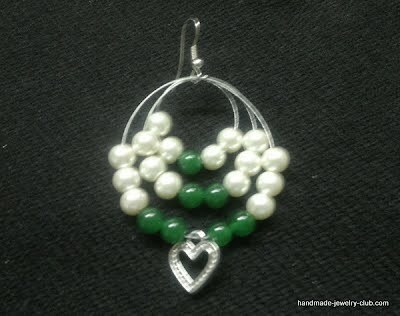 Reem, created the earrings, making a continuous multiple hoops with beads and a charm. This wire jewelry making idea is so simple that even a beginner can follow but advance jewelry makers would definitely love the design, too. You can choose to create the earrings as many hoops and as big as they are, however you want it! Step 1: Cut at least 20 inches beading wire or longer, depending on how big you want the hoops to be. Slide in a crimp bead into the beading wire, leaving 3 inches tail. 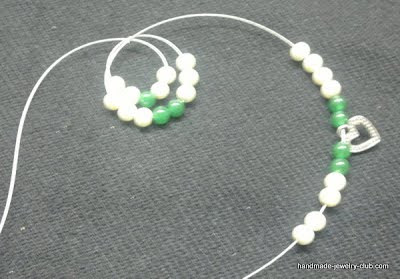 Slide in 5 beads, 2 white, 1 green and 2 white beads for the 1st hoop then insert the beading wire back thru the crimp bead and pull the wire to create a hoop. 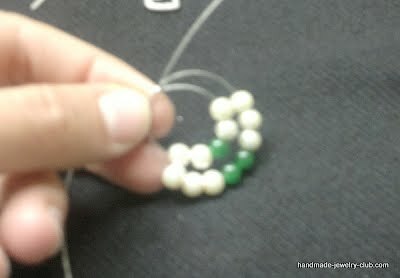 Step 2: Continue to slide in 8 beads and insert the wire back thru the crimp bead again then pull to create the 2nd hoop. Step 3: Slide in 12 beads and the heart pendant then insert the wire back thru the crimp bead again and pull to create a 3rd hoop. Step 4: Adjust the hoops and make sure that you have the crimp bead at the middle. When you’re satisfied with the hoops press the crimp bead with your flat nose pliers then attach your ear wire. Voila! You have your Multiple Hoop Earrings! Explore more tutorials with DIY Jewelry Making Magazine #48! Inside DIY Jewelry Making Magazine #48 are 8 Christmas DIY jewelry making tutorials. In creating these 8 projects, you’ll come across popular Christmas symbols such as poinsettia, snowflakes, bells and Christmas stars. Wire Jewelry Artist Interview Meet Mei of WireBliss!